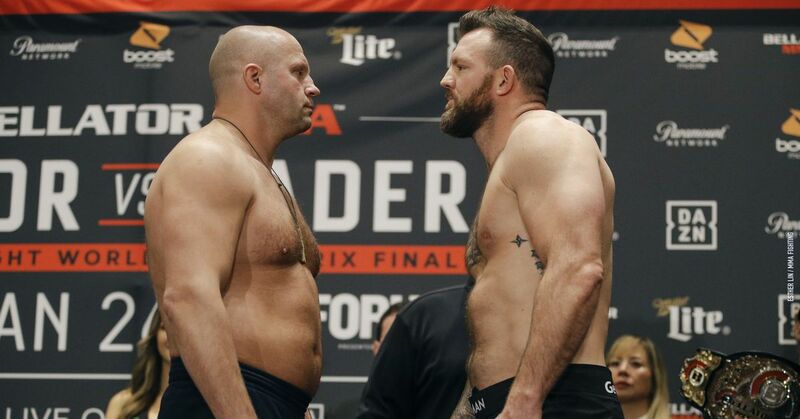 This is the Bellator 214 live blog for Fedor Emelianenko vs. Ryan Bader, a heavyweight at Saturday's Bellator event at The Forum in Inglewood, Calif.
Emelianenko, who has won four of his five fights, faces Bader, who has won six straight fights, in the main event. Check out the Bellator 214 live blog below. Round 1: Mike Beltran is the referee for this historic main event. Bader comes out and takes the center of the cage and is moving a lot. Fedor is standing and waiting for a shot. Suddenly Bader steps in with a long lead left hook that floors Fedor. Bader jumps on him with an absolute assault of a right shovel punch on the grounded Fedor and turns the lights out! Ryan Bader is a Bellator's first two-division champion!